In this episode we delve into the mind of Van Gogh, ask the questions the World wants to know about his ear, and talk about an art find of the century. Thanks for downloading. Vincent Willem Van Gogh was born on March the 30th 1853 in a Village called Groot Zundert in Holland. His father was a pastor, His mother was the daughter of a bookseller and was a gentle artistic woman. Vincent was her second Birth. His mother being deeply emotional never got over the stillbirth of her first child. It was not until 4 years later that she gave birth to Vincent. Because she was suffering this deep loss she never was able to form a bond with Vincent. He also never really got on with his father. Van Gogh’s parents had 5 more children after Vincent, including his supportive brother Theo, born on the 1st of May 1857. He was taught by his mother to draw. By the age of 8, he became quite good. Vincent as a young man would go for long walks in the countryside. He would frequently pass the gravestone of his dead sibling. Who was unfortunately for him called Vincent too. He would have felt that he could never take the place of the perfect baby Vincent. Because his Mother was grief-stricken over the loss of his firstborn, Vincent would look to form bonds with women later in life that were grief-stricken or older. Vincent did really well at school and was an avid reader He learned English French and German. Due to financial troubles, Vincent was forced to leave school early……. 1869 He went to work at an art gallery which his Uncle managed, it was part of the group of Goupil and Cie’s galleries which had branches throughout Europe. At around this time he met his first love Caroline Haanebeek, who was his second cousin, he proposed to her but she rejected him. In 1873 he was transferred to the London branch. Vincent developed a passion for his Landlady’s daughter Eugenie Loyer, the daughter of his landlady was in mourning for her father. Eventually, he revealed his feelings for her and found out she was secretly engaged. Vincent kept arguing with his landlady and Eugenie and was asked to move out. Whilst broken over the rejection, he was transferred to the Paris Gallery, he was now becoming more involved in religion. Vincent also became very opinionated and was persuading people not to buy what he considered to be “bad art”, at the gallery. In 1876 he left the gallery…. Still not satisfied, he returned to teach in Ramsgate in England but his religious fervor made him seek a post in Islesworth. He began preaching, this must have given him what he thought was a meaning to his life. In 1877 Vincent returned to Holland and after a short spell working at booksellers, he entered into to training at a ministry, he though had to leave early in part as he struggled with Latin and Greek. In 1878 He traveled to Boringe in Belgium to be a Missionary but he gave away his clothes and food to the poor, a church inspector found this scandalous. In 1879 his brother persuaded him to train as an Artist. In 1880 he moved to Brussels supported by his brother. Vincent without a proper teacher started to learn to draw from books. He actually was very focused and organised and studied diligently all aspects of drawing. With this strong foundation in the rules of drawing, he was able to express himself much more freely with his later works. 1881 he had an argument with his father and moved to the Hague. He then moved in with a pregnant prostitute, who was suffering from syphilis, Christine Sien Hoornik. He did this apparently to be deliberately living in sin, perhaps to get back at the church that had rejected him. This relationship lasted about 18months. 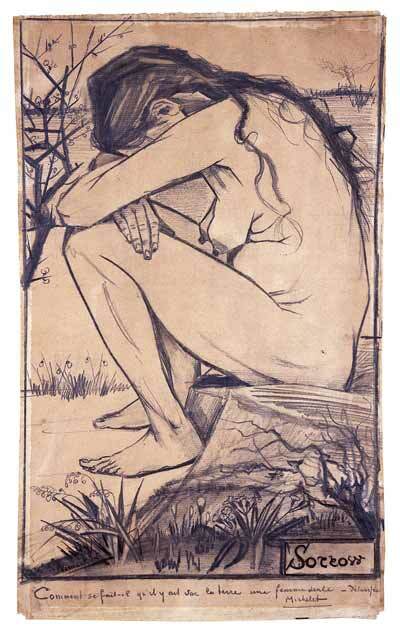 She was the model for the famous sorrow drawing. “Then I thought to myself, I’d like to be with a woman, I can’t live without love, without a woman. I wouldn’t care a fig for life if there wasn’t something infinite, something deep, something real.” Wrote Van Gogh in a letter to Theo. In 1883 he left the Hague. In 1884 Vincent’s mother injured her leg and he went to Nuenen to help her out whilst she was convalescing. During that time she received frequent visits from Margot Begemann, the youngest daughter of the family that lived next door. Vincent and Margot became friends and would go on long walks together. Margot is unique in that she was the only woman to really love Vincent. Unfortunately, this love was unrequited and this, along with extra pressures from her own family, drove Margot to take poison. Vincent helped to get medical attention for Margot and she eventually recovered, but her wish to one day marry Vincent was never to come true. In 1886 he went to Paris and lived with his Brother Theo. Paris he met Toulouse Lautrec, Renoir, Monet and Gaugin. Vincent was quite self-opinionated view and could be quite bombastic, in end only Gaugin stayed friends with him. He would quarrell quite often with Gaugin …….. By the End of the year, The famous Van gogh Ear incident happened. We asked Google about Van Gogh’s Ear. Google presented us with the question that “People also Ask”. Here we answer the questions the World is asking. Did Van Gogh cut off his ear? Yes he did he did with a Razor, for a long time scholars thought that it was just his lobe. A note from his doctor, Félix Rey contained a drawing of the injury, it shows his whole ear. 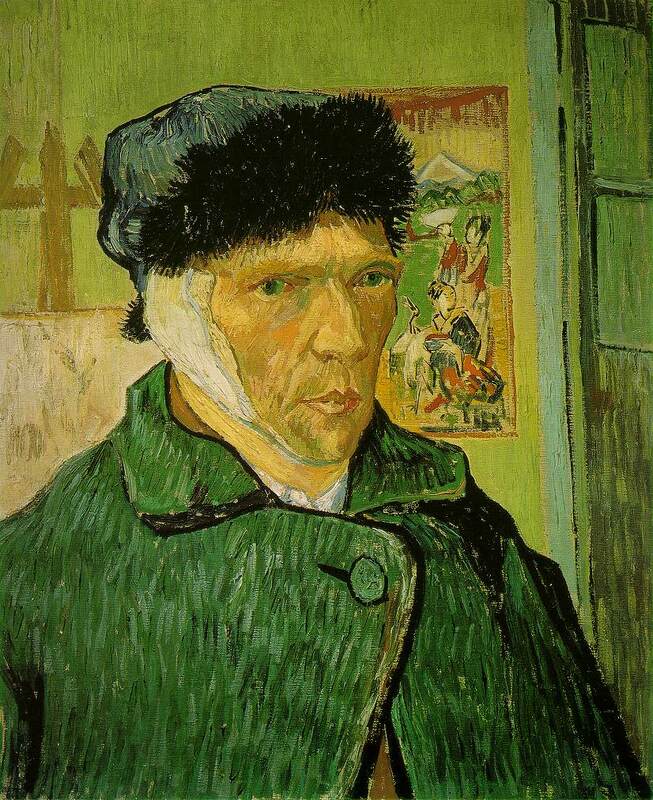 Which ear did van Gogh cut off left or right? His left ear, you can also see this in his 1889 self portrait with a bandaged ear. 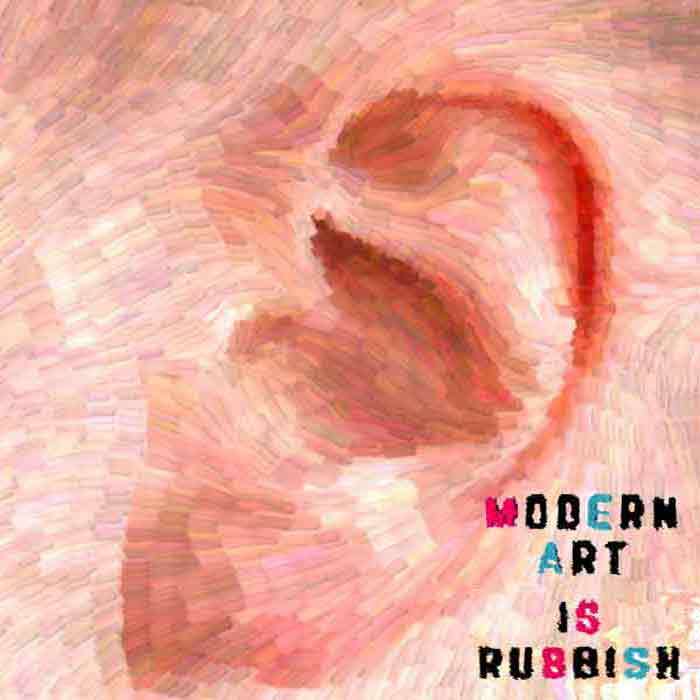 Who cut off Van Gogh’s ear? He did. But there is another theory, Gaugin, who was a talented fencer, sliced off his ear after an argument. They both agreed to cover it up, in order to avoid Gaugin going to prison. Why did Pablo Picasso cut off his ear? Why did Van Gogh remove his ear? He had been arguing intensely with Gaugin. Also, it is now believed that after receiving a letter Van Gogh was distressed to find out that his brother was getting married. Van Gogh had a very close relationship and bond with his brother, he may have felt that the marriage would threaten this. Van Gogh then walked into a brothel and gave his severed ear to a young woman 18-year-old maid he knew who was working in a brothel. On the 27th July 1890 whilst painting wheat field, Van Gogh sustained a gunshot to his stomach, wounded he struggled back to his room in an inn where he was staying. During the 2 days, he took to die, he explained that he had shot himself. After his death, Theo’s wife sought to catalogue and list Vincent’s paintings. Some were left in a damp basement, some used for target practice and one was even used to cover up a hole in a chicken run. Van Gogh created 900 paintings and made 1,100 drawings and sketches. Vincent was more successful in his lifetime than a lot realise. It is not known how many paintings Van Gogh created during his lifetime, but he sold at least 2. One was to Julien Tanguy who owned little painting supply shop and would also show the odd painting for sale. Theo also sold a work to a gallery in London which was bought by the sister of his friend. He also was known to trade drawings for food and paint and his art dealer uncle Cornelis, commissioned 19 drawings of the city of Hague, which the artist completed. We found what may be the find of the century on eBay a fourth painting of the Artist’s Bedroom in Arles. 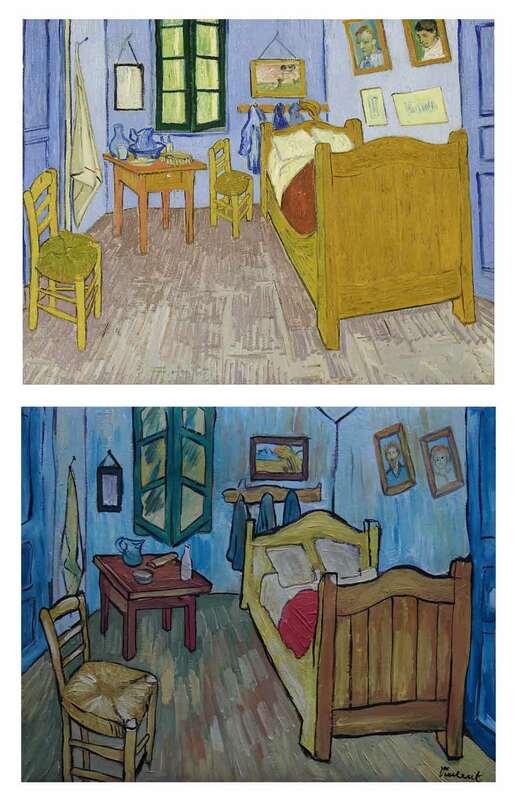 From 1888 to 1889 Van Gogh painted Three known studies of his bedroom at Arles. The top image is the third version he painted in 1889. The other work is listed on eBay as a “Rare Post-impressionist original oil” If this is in fact a previously before unknown masterwork it will be worth millions, however, we have spotted some troubling differences. The Van Gogh Museum website is a brilliant resource for Van Gogh and a really enjoyable browsing experience. You must have a look at the Google art project’s HD reproductions of his works you can zoom in to see individual brush strokes. Someone has created a 360 view of Van Gogh’s “Starry Night” painting.